Easter reminds me of so many things. I remember the time when we all would want to go for midnight Mass at the local church in Mt. Abu. It was not for any religious reason, but it gave us an opportunity to be out of our boarding school at midnight and that was a cool thing to do. Once our class was allowed to go to the church to attend the Mass. More than the Mass I remember our work from school to there, dark hills on all sides looming over us, older girls making us scared that tigers were ready to pounce on us, and the constant reminder by the nuns to walk silently. The whole experience of attending the actual Mass was so humbling. Easter meant loads of craft things to make when I was teaching, Easter eggs, bunnies, flowers etc. It made the classroom very cheerful. Easter means egg hunting at school, fun and the best part was we got to eat what we found. Easter in UK means huge chocolate egg filled with more tiny chocolates. Easter meant the rains will arrive soon in Kenya and this year too it rained a lot in Mombasa during the night. Years back Easter meant the the Safari Rally, but unfortunately for the past many years it comes and goes without anyone actually realising it. Safari Rally during Easter meant that a lot of people could watch it because of the holidays. Since they changed it, (don’t even know when its held!) hardly anyone gets the opportunity to spectate it. 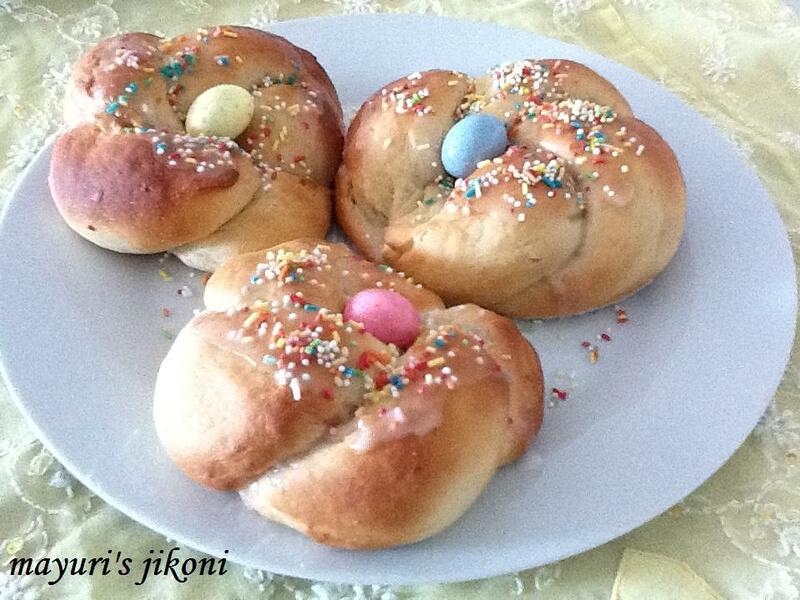 Anyway, for this Easter I made some Italian Easter Bread but eggless. The original recipes all have eggs in the dough and then coloured semi boiled eggs are placed on the `nests` or braided bun and baked. As mine is an eggless version, I omitted the eggs in the dough and used colourful tiny chocolate eggs which I found at the Mall of Emirates in Dubai. As for the ingredients for the bread, I browsed around quite a few recipes and took a bit from each one and came up with the following recipe. If you are not using instant yeast then you will need to ferment the yeast before using it. Take half a cup of warm milk (from the measured quantity) and add a tsp of sugar to it. Mix it and sprinkle the yeast over it. Cover and let the yeast ferment fro 10 minutes. The liquid should have become frothy after 10 minutes. Soak the saffron in the remaining warm milk. Sieve the flour. Add sugar, anise seeds, orange peel and salt. If you are using instant yeast, add it to the flour at this stage. Mix well. Add the butter and rub it into the flour. Add the orange blossom water or vanilla extract to the milk. Use the milk to form a soft dough. Use the fermented yeast at this stage. Knead the dough for 15 minutes till it is smooth and silky. If you are using the machine, let the dough knead for 10 minutes. Form the dough into a big ball. Grease a big bowl with butter. Rub a bit of butter over the dough. Place the dough in the bowl, cover with a cling film and place the bowl in a warm place. Let the dough rise to double ts size for nearly 3 hours. Gently punch down the dough with your knuckles and divide it into half. Divide each part into 4. You should have 8 parts of dough. Take one part of the dough, divide it into 2. Roll each part into a 6 to 8 inch long rope. Braid or plait the 2 parts together (much like a twisted rope) and make a circle with it. Make sure you pinch the ends well and its tucked underneath. Place the braided bun onto a greased baking tray. Repeat steps 9 and 10 with the remaining dough. You should have about 8 nests or buns. Let the buns rise to nearly double its size for nearly 1 to 1½ hours. Preheat the oven to 180°C. Place the trays in the oven and bake the buns for 20 to 25 minutes or till the buns are golden brown in colour. Remove the buns from the oven and place them on a wire rack to cool down a bit. For the topping, mix icing sugar and milk together. This is glace icing. Glaze the buns with the glace icing. Add sprinkles on top. Place an egg in each of the dented middle. If you prefer more glace icing, just double the icing sugar and milk. For a more thicker glace, add only 1 tbsp of milk. If you want to add an egg to the dough, then you should reduce the amount of milk used. If you want to use real eggs on top then make sure the dent in the middle is slightly bigger before baking the buns. For real colored eggs, dip hard boiled eggs in ½ cup hot water with food colour and 1tsp vinegar. Leave the egg for 3-5 minutes and remove. Use the dough to bake it into normal buns or a loaf. Delicious for any tea time party.